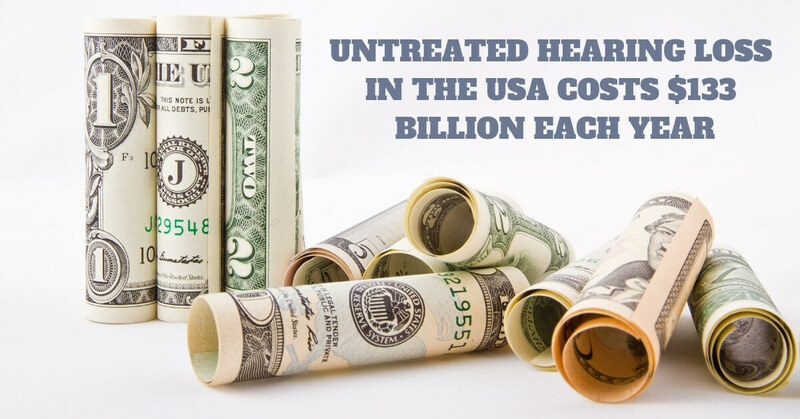 According to a recent report, untreated hearing loss in the USA costs $133 billion each year! Millions of Americans choose to live with hearing loss rather than taking steps to look after their hearing health, and two thirds of those with hearing loss don’t invest in hearing aids. For many, they think the cost of hearing aids aren’t worth the investment, but not only are they jeopardizing their health, they’re hurting their bank accounts as well. A report by Hear-it AISBL, an international, non-commercial organization based in Belgium, estimates that the costs of untreated hearing loss in the USA is roughly $133 billion each year. That’s $9,100 per person per year who has an untreated hearing disability! The report examined people with hearing loss, the use of hearing devices to treat hearing loss, overall quality of life, and rates of unemployment. Why does hearing loss cost so much? Those living with untreated hearing loss have a lower quality of life than their hearing peers, are more likely to be socially isolated, and risk higher rates of stress, anxiety, and depression. When it comes to job performance, they have a harder time hearing instructions, focusing on tasks, or keeping everyone on the jobsite safe. There are higher rates of unemployment among those with hearing loss, and this also contributes to the high costs of untreated hearing loss. Not only that, but those with untreated hearing loss were more likely to face rapid cognitive decline, and experience an earlier onset of dementia or Alzheimer’s Disease. “The scientific report clearly demonstrates that untreated hearing loss is a major health issue and that untreated hearing loss has a huge economic and social impact on our society. It also documents that checking your hearing and treating hearing loss pays, both for the individual and for society,” says Secretary General from hear-it AISBL, Kim Ruberg. The Hear-it AISBL meta study looked at the effectiveness of hearing aids to treat hearing loss, improve quality of life, maintain jobs, and lower health care costs. They found that hearing aids made a huge difference when it came to increased quality of life and job performance. Consistent hearing aid use allows you to hear clearly, interact with the world around you, notice all the sounds in your environment, and stay connected. Hearing devices are designed to increase comprehension in conversations, and they make it easy to follow conversations and maintain your relationships. Communicating effortlessly with your family helps maintain your quality of life, and avoid feelings of social isolation or depression. Hearing aids help you hear at work, and you’ll be able to contribute valuable insight during meetings, hear instructions clearly, and do your job effectively. Do you work in an environment where safety plays a big role? With hearing aids, you’ll be able to hear warning bells or your coworker shouting, you’ll reduce your risk of accident or injury, and experience fewer doctor visits or hospitalizations than those who don’t treat their hearing loss. Worried that you’re not hearing as clearly as you used to? Do you think you might have hearing loss, and afraid it’s affecting your personal or professional life? At Elite Hearing, our team of hearing health specialists will perform a comprehensive hearing test, and together we’ll discover your unique hearing loss and hearing needs. Whether you need help hearing at work or around the dinner table, we’ll suggest the perfect device that will be able to keep up with you wherever you go. Don’t settle for the high costs of untreated hearing loss, but invest in a quality pair of hearing devises that will give you back the ability to hear in noise, follow conversations, participate in all the leisure activities your love, and save your wallet from the high costs of hearing loss.